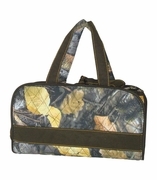 Embroidered plaid accessory bag for small travel necessities, bath and beauty products or makeup. Just in time for fall-winter travels and gift giving season. 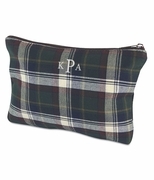 Attractive red and black plaid pouch is a cotton jute blend. Add the matching tote bag, item RS-42411 for a complete travel set. 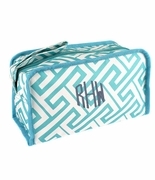 Add our new accent monogram that will be placed just below the zipper, 1"H.
Personalized plaid accessory bag measures 10"W x 6"H. Zipper closure.